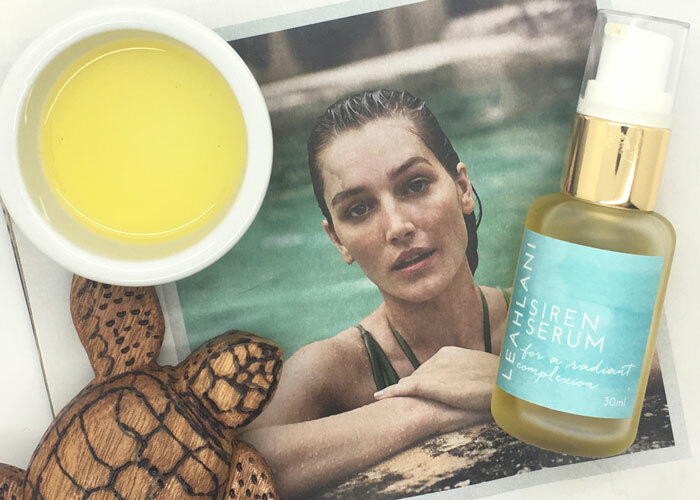 With just one pump, you can bathe your skin in perky orange, pink grapefruit and mandarin, the dominant essential oils in Leahlani Skincare’s Siren Serum. Used every night, this radiant blend of oils rich in vitamin C and vitamin A will bring your skin brightness — all while bringing a smile to your face. You will not be able to feel anything but cheer while massaging this golden oil blend onto your face. Its cheerful, citrusy scent is an instant mood lifter that transports you to endless summer days. While it transports your senses, with regular use, it can transform your skin. Leahlani Skincare’s Siren Serum promises an even skin tone and gorgeous glow — and it definitely delivers when it comes to that Hawaiian glow. That’s thanks to a base of jojoba and sea buckthorn oils, known for second-skin texture (jojoba) and anti-inflammatory properties (sea buckthorn). These two carrier oils are gently infused with powerhouse essential oils and absolutes, including carrot seed, geranium, jasmine, rose, ylang ylang and grapefruit. Each is added for its distinct ability to cleanse, tone, protect, soothe and calm the skin; if you are sensitive to EOs or have never used very intense blends before, you’ll want to patch test to confirm skin compatibility. Organic cold pressed golden jojoba oil (Simmondsia Chinensis), organic cold pressed sea buckthorn CO2 (Hippophae Rhamnoides), luminess algae (Algae) , essential oils of: organic orange (Citrus Aurantium Dulcis), organic pink grapefruit (Citrus Paradisi), mandarin (Citrus Nobilis), Egyptian jasmine (Jasminum Officinale), carrot seed (Daucus Carota Sativa), lavender (Lavandula Angustifolia), palmarosa (Cymbopogon martini), ylang ylang (Canaga Odorata), geranium (Pelargonium Graveolens), german chamomile (Matricaria chamomilla), cape chamomile (Eriocephalus punctulatus), tangerine (Citrus Tangerina), clary sage (Salvia Sclarea), patchouli (Pogostemon Cablin), rosewood (aniba rosaeodora ), rose (Rosa Damascena), rock rose (Cistus ladaniferus ), frankincense (Botswellia Carterii) and LOVE. You’ll also want to avoid using Leahlani Skincare Siren Serum with acid products or AHA / BHA products; it will likely irritate your skin. Save Siren Serum for when your skin is in maintenance mode and you want to turn up the brightening factor with just one product. My skin prefers to take shots of Siren Serum after cleansing and heavily misting with a single-ingredient hydrosol. This is to keep Siren Serum the star of the show — and to minimize any ingredient interactions. At times, I have mixed it with very simple creams as well — think zero-oil, zero-fragrance creams — to get a little more hydration when needed. But, applied over a healthy misting of hydrosol, Siren Serum offers enough moisture with just one pump if you have combination / oily skin like me. In fact, at times, I used way too much (2-3 pumps, oops) and looked overly shiny and felt way too slick. Lesson learned: Follow instructions, which call for 1/2 to 1 full pump. That means a lot of mileage out of this 30 ml bottle. Overall, Siren Serum is a lovely, cheerful facial oil that can help you through a blah, gray winter. However, if you’re sensitive to essential oils or scents in your facial care, you’ll want to sample this oil first. It’s not a repurchase for me as facial oil, but it’s a madly fantastic body oil for invigorating my senses in the A.M. (and this night owl / evening mermaid sure does need the help!). What scents do you prefer in facial skincare? Are there any essential oils you avoid? Have you tried Siren Serum or anything else from Leahlani Skincare? Tell me in the comments!